The lively Spanish capital of Madrid loves to eat, and the unpretentious food scene is characterized by leisurely meals enjoyed with friends over good wine. Here are some signature Spanish dishes and food tours you won't want to miss. Like many big cities, Madrid is a melting pot, but it has a few of its own typical foods as well. Some dishes, like patatas bravas (fried potatoes with a slightly spicy tomato sauce), tortilla de patata (Spanish omelette), and Iberian ham have become popular throughout Spain. When the weather gets cold, Madrileños reach for a bowl of cocido madrileño, a rich and flavorful pork stew simmered with chickpeas, vegetables, and chorizo. For a quick and easy bite on the go, it doesn’t get more local than a bocadillo de calamares (calamari sandwich)—squid rings fried to a golden brown and tucked within crusty french bread. After a long night out on the town, a popular dish called churros con chocolate makes for a must late-night (or early-morning) treat. Take a nighttime walking tour of Madrid’s old town to sample the city’s best Spanish food. Uncover the secrets of Spanish wine with tastings at tapas bars and historic taverns. Learn to make paella and other traditional dishes in a cooking workshop. Eat like a local on a private guided food tour to Madrid’s hidden eateries. Explore some of Madrid’s food-centric neighborhoods, like Lavapiés and the Literary Quarter. In Spain, culture and cuisine are inextricable. Experience Madrid’s historical and culinary highlights on an evening walking tour, perfect for beating the capital’s scorching daytime heat. In between critically acclaimed tapas bars, you’ll learn about the ancient history of Madrid’s Old Town and sample local specialties washed down with sangria, Spain’s favorite summer beverage. This small-group tour is limited to 10 food lovers. Savor the best of Madrid’s world-famous cured meat and wine during this 2.5-hour tasting session at two top Iberian ham producers. 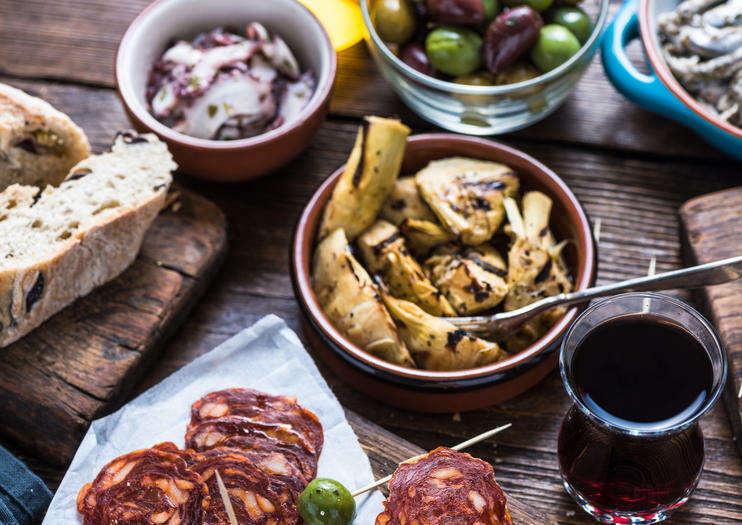 Taste high-end samples of specialty products like salchichón, lomo, chorizo and more, complimented by local wines, Spanish Manchego cheese and other classic tapas. During your visits you’ll also get to observe the slicing methods of a professional Iberian ham cutter, learn about the different curing styles and get tips on shopping for some of your own. An expert food guide, plus all ham, tapas, cheeses and wines, are included.